A new pictorial postmark offered by the U.S. Postal Service in Houston commemorates SpaceX's Dragon cargo flights to the International Space Station. HOUSTON — The space capsules that are used to deliver crew and cargo to and from the International Space Station are now available for delivery on envelopes and postcards mailed through the Houston post office. Russia's Soyuz piloted spacecraft and SpaceX's Dragon unmanned cargo capsule are featured on two new pictorial postmarks now offered by the U.S. Postal Service (USPS) in Houston. The black and white designs both include the space station as well. "As a community service, the [U.S.] Postal Service offers pictorial postmarks to commemorate events celebrated in communities throughout the nation," the USPS describes on its website. The "ISS Dragon Space Station Postmark" features the gumdrop-shaped capsule nearing the orbital complex. The words "ISS Mission Control Station" are inscribed above the rectangular design, with "Houston, TX 77201" below. The "ISS Soyuz Houston Postmark" is similar in design, with the Russian three-seater spacecraft illustrated in the lower right corner as opposed to the Dragon on the left. Both postmarks were designed by space artist Detlev van Ravanswaay of Duisberg, Germany. It is popular among stamp collectors to have envelopes stamped and postmarked to commemorate the dates of significant or historic events. Referred to as "covers," the postal cancellations serve as a record of when and where the event occurred. For events that occur in space, it is common for collectors to have their covers postmarked at postal stations located near where the mission was launched or, as in the case of Houston, where it was managed by flight controllers. NASA's Mission Control oversees the station, while flight control centers in California and outside of Moscow direct the Dragon and Soyuz, respectively. Both postmarks include interchangeable dates, such that requests can be made for any event date beginning Aug. 8, 2013 and going forward. Requests must be received in Houston however, within 30 days of the requested date. The USPS advises on its website that those desiring the use of one of the postmarks should "affix stamps to any envelope or postcard of their choice, address the envelope or postcard to themselves or others, insert a card of postcard thickness in envelopes for sturdiness, and tuck in the flap." "Place the envelope or postcard in a larger envelope and address it to [the station's address]," the USPS writes. 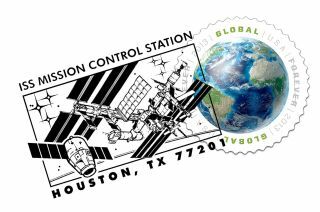 The "ISS Soyuz Houston Postmark" now available from the U.S. Postal Service in Houston depicts the Russian piloted spacecraft arriving at the International Space Station. Collectors can also send stamped envelopes or postcards without addresses, so "long as they supply a larger envelope with adequate postage and their return address," states the postal service. "After applying the pictorial postmark, the U.S. Postal Service returns the items (with or without addresses) under addressed protective cover." SpaceX is one of two companies NASA has contracted to deliver cargo to the space station. The company's Dragon capsule is currently the only vehicle capable of returning large amounts of experiment results and hardware to Earth. SpaceX is slated to launch its next Dragon capsule atop a Falcon 9 rocket from Cape Canaveral, Fla. in December, on what will be the company's third commercial resupply mission to the space station. Russia's next Soyuz spacecraft is scheduled to liftoff from the Baikonur Cosmodrome in Kazakhstan on Sept. 25 with three new crewmembers for the station's 37th expedition. NASA is relying on the Soyuz to fly its astronauts to and from the orbiting outpost until U.S. commercial spacecraft are ready to begin crewed launch services in 2017. Click through to collectSPACE.com to see images of the new ISS Dragon and ISS Soyuz Space Station Postmarks.